Read on to find out what our customers think of what we do! Around three quarters of our new customers come to us through previous happy customers, so we must be doing something right! Mirefoot is a rural residential estate with multiple buildings, which dates from the 17th Century. 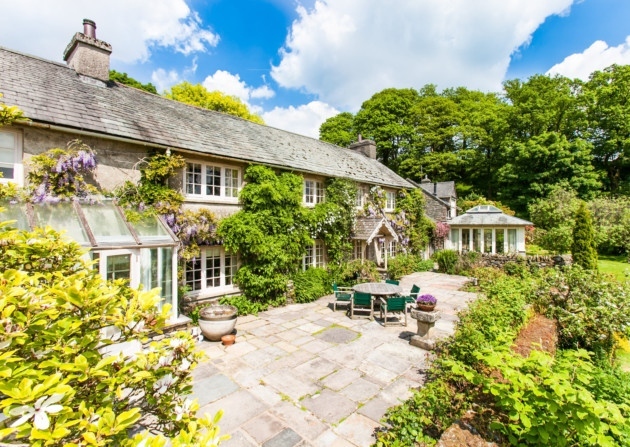 It has a large detached house and 5 luxury holiday cottages, extensive gardens, and a gym - and it will soon have a swimming pool and spa (currently under construction). Mark, the owner, says that he chose to install biomass because he wanted a ‘one-stop system’, providing greener energy. He was also attracted by the RHI. The new system replaced a ‘fragmented’ system with lots of gas boilers, each serving a different part of the complex. We designed and installed a 216 kW tandem boiler system from KWB, consisting of two 108kW Pelletfire Plus boilers working in tandem. The boilers are fed via vacuum feed from two 8.5 Tonne Big Bag Pellet Tanks. The new system feeds everything. 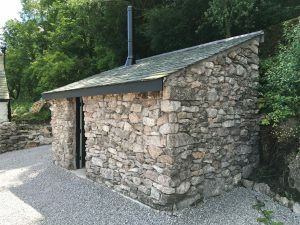 It provides heat and hot water to the existing house at Mirefoot, which is a stone built, slate room property, with radiators. It provides heat and hot water to the five holiday cottages, four of which are stone built and have been recently renovated to a high standard, and the fifth which is a new-build. The cottages are heated via a mixture of under-floor heating and radiators. There is soon to be a new swimming pool and spa building, which will also be heated by the boiler system – it will have under-floor heating and hot air through an air handling unit. Mark’s experience with Sustaburn has been a positive one – it was ‘remarkably smooth and gradual’, with any minor hiccups along the way ‘overcome easily through discussion and agreement’. He says that ‘the water is hotter… there’s plenty of it’ and the whole system is working well – ‘all good so far!’. He is looking forward to the completion of the swimming pool building, which we will then connect to the boiler system. Watch this space for a progress update! "Fantastic! Great customer service, and I feel I can ask the silly questions!" 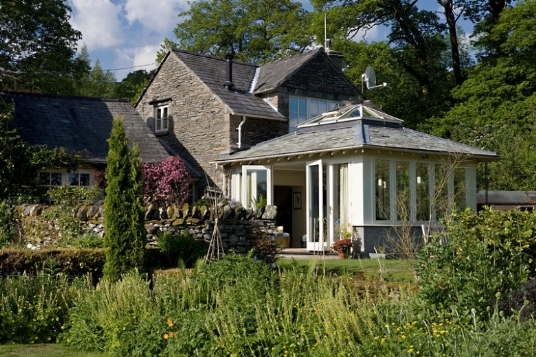 White Cottage is an old stone-built cottage, which has recently gained planning permission for a new-build extension, which will be a separate building about the same size as the existing cottage. Work has begun on the build, but rather than wait until it is complete, the client wanted to install the biomass boiler and have it feeding the existing radiator and hot water system in the cottage straight away. Amy says that she researched lots of different options for an environmentally-friendly heating system, being off the mains gas grid. She chatted to others with various different heating systems, and concluded ‘it was our best green option’. 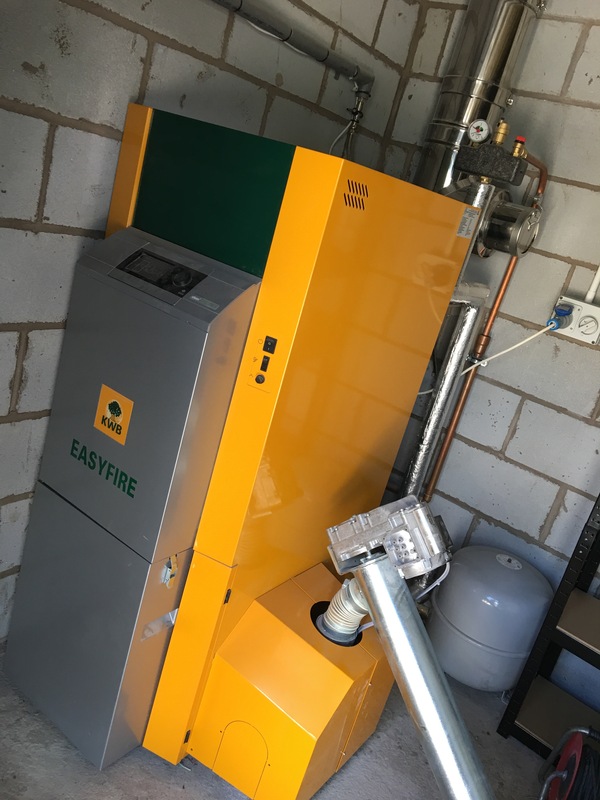 We designed and installed a KWB Easyfire 2 boiler system, which has a 22kW capacity. The pellets are fed into it via an auger, making it automatic filling. 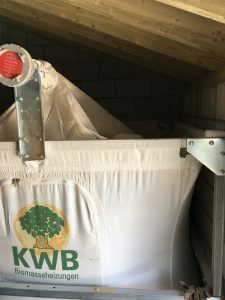 The pellets are stored in a KWB Big Bag Pellet Tank, which can be filled with a large amount of fuel in one go. It is housed in a new stone structure. Since the new system has been up and running, Amy has noticed a ‘total change’. Running costs are cheaper, and everything is ‘running smoothly with no / hardly any checking on the system’ Another benefit of an automatic fill system is ‘no need to fill up the bucket!’ She reports that it is ‘all fab’. "Just thanks for making the process smooth!" "Excellent communications, support and servicing" - our award-winning project! We have recently won the Sustainable Building Awards 2016 'Most Innovative UK Restoration Project' for the work we carried out on Allan Bank's heating and hot water system. 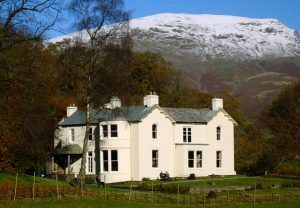 Allan Bank is a large early 19th century country house in the Lake District, above the head of Grasmere. 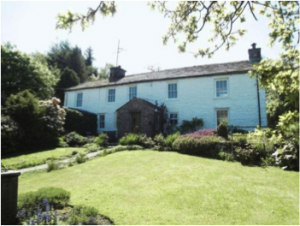 It has a rich history of notable tenants, including William and Dorothy Wordsworth, as well as Canon Hardwicke Rawnsley (one of the founders of the National Trust). It has always been a residential property, but now the site is being made to open it to the public for the first time in its 206-year history. Recent years have not been so kind to Allan Bank and so, in need of more than a little TLC to return it to its former glory, Allan Bank is the subject of an exciting and unique National Trust project - which includes the recent installation of a new biomass heating system from Sustaburn. Part of the National Trust's energy strategy to 2020 is a commitment to: 'conserve energy, grow our own electricity and heating, get off oil and provide inspiration'. Converting to biomass ticks all of these boxes. We replaced the original oil boiler system with a wood pellet boiler system. The pellets are stored in a large fabric bag and are transferred from this pellet store to the boiler via a vacuum system. The heat from the boiler is transferred to water, which is pumped through the boiler system and stored in a buffer tank; the water is then pumped around the radiator system. As part of the works, the old pipework of the heating system was replaced - and, although new cast iron radiators have been added to the system to help distribute the heat around the building more evenly, all the original radiators have been retained as part of the system. The control system for the heating is also very clever: the heating circuits run on a weather-compensated system, which means that the boiler system will vary the temperature in the radiators according to both the outside temperature and the internal temperature of the building. The Trust says the installation was trouble free, and completed on time: 'we are very happy with the installation and service!' The difference now the system is up and running is noticeable: 'there is now a constant supply of hot water and heat.' Another benefit is that the RHI payments supported the cost of installation. "We recommend you to our visitors, who are often fascinated by this system!" 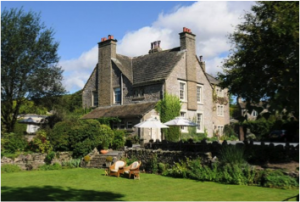 not tried to convince us to take a general solution"
The Traddock is a busy Georgian country house hotel, set in the Yorkshire Dales. The hotel needed a larger boiler to replace a ‘tired, under-sized and sooty mess of an oil boiler’. Wood pellets offered a cheaper fuel source, and they were also attracted by the Renewable Heat Incentive (RHI) subsidy. We designed and installed a tandem system, with a 9-tonne fuel store, feeding pellets to the boiler via a vacuum feed. The new system sits within an existing boiler room, and provides heating and domestic hot water to the entire hotel. Getting the boilers into the tight space in the basement boiler room was a major concern for the hotel’s owners. However, we reassured them (with lots of measuring up and technical drawings!) that all would go well. From the start, the owner says, Sustaburn were very supportive - ‘Martin established trust and expertise’. The installation ‘went smoothly with very little drama’ – and was up and running a day earlier than expected! Would they recommend us? "Absolutely! With the best price and technical solution – Sustaburn were flexible and professional from the first meeting”. 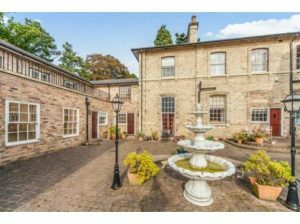 Potto Hall is a large, Victorian property off the mains gas grid. The fuel bills for the existing LPG boiler were huge – around £20,000 per annum. 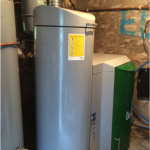 They decided to upgrade their system to a wood pellet boiler, to save on these fuel costs. The new system is an Ökofen 36kW pellet boiler, with buffer tank, solar heat exchanger, domestic hot water heat exchanger, and distribution pumps for 2 radiator circuits. The client was very happy with the installation process – it was ‘trouble-free’, with any minor issues during installation ‘all dealt with professionally and diligently’. The running cost of the heating system has reduced dramatically – and is now down to around £2000 a year – a reduction of 90%! This client was converting a barn, and wanted the best, and most eco-friendly, heating and hot water system possible. After researching his options, he decided that biomass was the way forward. The new system is a 20kW Okofen boiler, with a hand-fill pellet hopper. It provides heat via underfloor heating, as well as feeding a radiator system and providing domestic hot water. 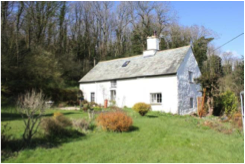 He was very happy with the service we provided, saying "having renovated a barn and worked with plumbers / builders / electricians etc - your company is head and shoulders above the rest!" "First class in all respects - more like working with friends than contractors!" Mr and Mrs Hope came to Sustaburn looking for a clean, cost effective heating system. Their solid fuel boiler broke down and was irreparable. We installed a 15kW Okofen pellet boiler, which provides heating for radiators and domestic hot water. They wanted an automated system, so the fuel is fed into the boiler via a vacuum system. The installation was 'on schedule, and efficient in all respects'. There were a couple of minor issues, including a faulty immersion heater which needed to be replaced, but they were happy that 'practical solutions were reached by on-going conversations'. We always strive to ensure that any problems or issues are worked through as soon as humanly possible, and we work closely with all our customers to work out the best solutions, so that everyone is happy with the result. The Hopes felt that working with Sustaburn was 'more like working with friends than contractors!' They are happy to recommend us - it was 'first class in all respects'. The Hopes say that the advantages in running cost, heat output, speed of heat and hot water delivery they are now seeing made the 'high initial outlay' well worthwhile. In any case, the RHI payments are now offsetting those initial costs. The installation has made a real difference to their heating and hot water and we are pleased to have helped make this happen! This client has a large property, which used to be a barn. They have 14 radiators, which were running from a coal-fired system. This was not adequate for the job, and they could ‘never get the house warm’. In addition to this, they say it was ‘very expensive, very dirty, and very inconvenient’. 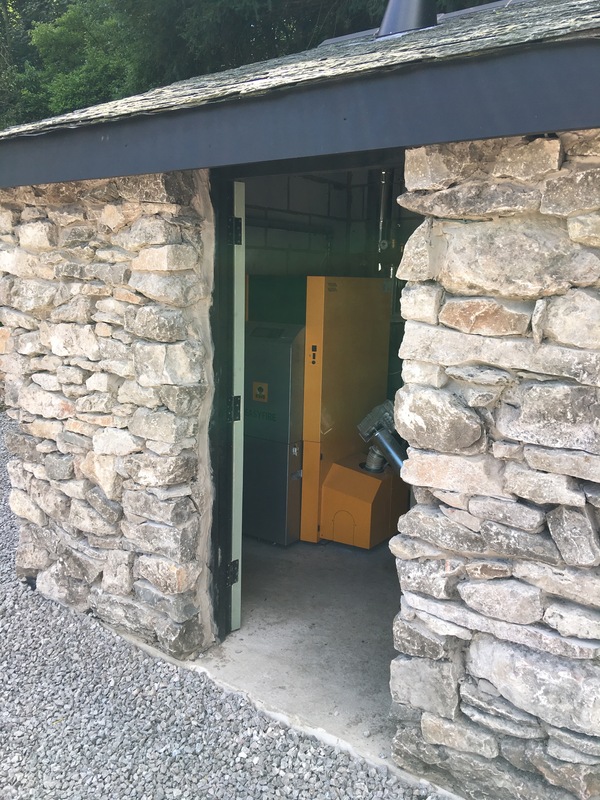 Having researched many different options, they decided a biomass boiler was a great choice for a property the size of theirs. The Government RHI incentive also made the option very competitive. They found the installation ‘really straightforward’ – and it took just 4 days. They say that our team were ‘Very professional … very helpful. Work force great, tidy, quick and polite’. Their experience of our after care was that we are ‘Always available on the phone for support and help’. 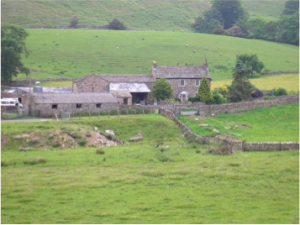 Dalefoot Farm decided to go for biomass primarily to save on running costs for their new heating system. The site includes a farmhouse, a new build and an award-winning family bakery. We designed and installed a boiler system that would feed into the existing heating and hot water systems. At 56kW, the system is fairly large – as it needed to be to provide all the hot water needs of a busy bakery! Since installation, the fuel costs for the farm are “much, much cheaper - and the hot water never runs out in the bakery, whereas it had before”. Would she recommend us? “Yes – and I have done, because from start to finish, the installation was carried out in a very professional manner”. "Excellent - you were the only people who understood our requirements. V good after care, well-designed, top notch, good value"
"Always extremely helpful. We were one of the first by Martin Robinson in this area at the end of 2011. I have dealt with Sustaburn since the beginning and cannot speak highly enough about this company and the boiler we purchased from them. It has quite transformed the hall. Running costs are consistent and the heat is easily turned up when the hall is being used. Hot water is good. We are so pleased with it - the hall is now used by many and this type of boiler has been of huge benefit in keeping the building warm and usable." "All excellent - straightforward - friendly reliable service"
"Straightforward! Clear explanations of proposed work and good levels of communication. Very high standard of engineering work and installation. Much less disruptive than I had envisaged. Good levels of engagement with all members of the team, who had high levels of skills in their respective roles. [The system is] very reliable and responsive - especially hot water delivery. Much easier to control and regulate, and to monitor. "The heat output is very good on both heat and hot water. The cost of pellets is comparable to the old system. [The installation was] quick and clean and carried out in a professional manner. Excellent - no more needs to be said!" "Excellent - always helpful. Well planned and well executed. The house is now uniformly warm." Would they recommend us? "Yes - no reason not to, every reason to do so!" "Very good - you know what you are talking about!" "Very satisfactory, thank you! Very efficiently done considering the complexities of systems involved... the house is noticeably warmer." "Excellent. Well planned and tidy installation, full support with planning application. Martin was very helpful through the minor issue with planning permission due to National park / listed building. Excellent product and service"
"Very professional and knowledgeable. We now benefit from all radiators being turned on and the whole house being at a constant temperature. We have recommended several times, because our experience with equipment and the installer has been trouble free"
"Just to say a massive 'Thank You' for working so hard this week ... it is truly fabulous to have a warm house again (esp. since it's dropped to 1.6 already!!!!). Gerald and I are delighted to have overcome our difficulties [with the old boiler] at last." "Pleasant workforce, ready to respond to any queries...improved heat output and hot water delivery...reliable, courteous team"
"First rate...Easy and simple...Great service and return on investment"
"Excellent. All queries dealt with promptly and the whole process was very professional and painless from start to finish. ... Pragmatic cooperation between tradesmen. Smooth and efficient." "Faultless, clean and efficient... Running costs are lower...Excellent- could not be any better!" Explore which biomass heating solution is right for you.